It has been a frustrating couple of weeks since I posted last. There have been lots of fun moments, interspersed with a fair number of worries and problems. With the new engine fitted in Nepal, I really felt that we were set for a good long run of pretty trouble-free motoring, alas this has not been the case. It seems that I'm going through a sticky patch as far as my chosen transport is concerned. Tomorrow I leave for Laos with Susana, who has been very understanding about this lack of transport, but in the end the bike is not fixed and the days were beginning to eat into her holiday time, so it seems best to leave the bike behind, with the diesel mechanics that we have found, to hopefully come up with some answers. Unfortunately an hour before I'm wrote this, I had been told that I need to extend the Thailand Visa in order to extend the motorcycle temporary import licence. 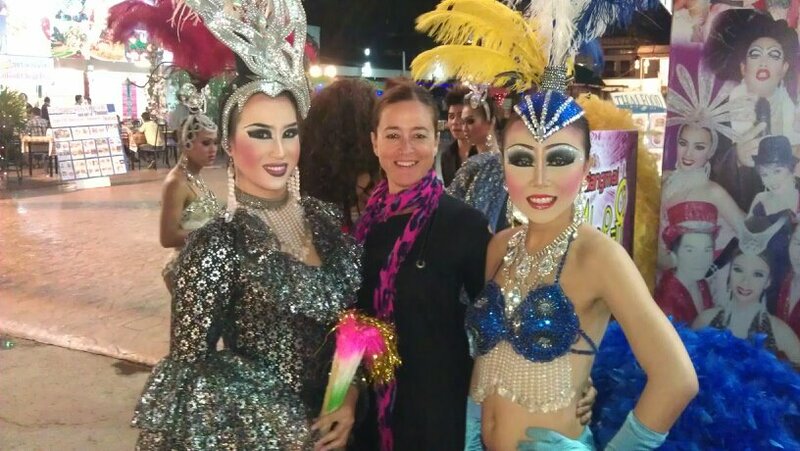 Our flight is at 6 o'clock tomorrow morning and I cannot do it in time, so when I leave Thailand eventually, there will be a fine, imprisonment, or it may not be noticed….I have past caring. I last wrote from the Burmese border at Mai Sae as part of this incredible route I was taking around the north of the country. They have to be some of the best biking roads in the world, not only for the beautiful landscapes, but mile after mile of near brand-new road, fantastically cambered with unrelenting cornering joy. It was in Mae Sae that I noticed the rear sprocket teeth were becoming worryingly shallow, and the need to change the sprockets and chain was pressing. A call to Joe, a renowned German bike mechanic based in Chiang Mai for the last 20 years, gave hope that he would be able to replicate the sprocket etc. It was a days run there, which on arrival proved to be a bit of a red herring, as the sprocket was incorporated into the brake drum and could not be bodged. Luckily there was a room at Riders Corner to stay and from there arrangements were made with Henry to courier the spare parts over. This gave me 4 days to kill, so I tighten the chain even more and set off on the remaining leg of the Northern circuit. On the way to Pai, I went to the Tiger Kingdom, which was recommended as an attraction worth seeing. I'm not very sure about zoos and wild animals in captivity, and my confusion on the matter was only confounded. Here were these gorgeous animals that we were allowed to effectively play with, as one would a pussycat. They were all part of a breeding program and they earn their keep by having their tummies rubbed by literally hundreds of people on a daily basis. By the time they are 2 years old this stops and they are then sent to other zoos around Thailand. I would not go there again, but accept that for these animals to escape extinction, their fairground attraction type life is a necessary evil. One of the many great guys I met at riders corner is Dave. He had warned me that he had got stuck in Pia for 2 weeks on his 1st visit, such is the delight of the place. Dave has been traveling off and on for a few years, paying his way as a web and app designer. A perfect job to have for this lifestyle. He is also very generous with his time helping incompetents like me set up their GPS etc. His latest adventure is http://www.rideforcambodia.com, which involve taking a group to Cambodia, buy up some scooters, ride them around for 2 weeks and then sell them, giving the proceeds to charity...what a happy combination of motive and fun. Although I enjoyed Pia for a couple of nights, my timetable did not allow for longer. I did go for a short drive around on my day off, and it was there that I really realised that I had some problems. There was one particular hill that I started going up but Batty conked out. I turned around and went back home. The next day was a continuum of stunning roads in gorgeous surroundings… have I got the message across that this place is motorcycling heaven yet?.... The trouble is that the hills only got yet steeper and I ended up having to be towed on 2 occasions up the hills by trucks. As chance would have it I met these fellow bikers from Germany, who were on a 3 week holiday, and had hired bikes to do these circuits. They love it so much that once they have finished it over 4 days, they promptly turned round and did it the other way round. Anyway they were kind enough to pull me up one hill, and then stay with me whilst we went to find somewhere to stay. 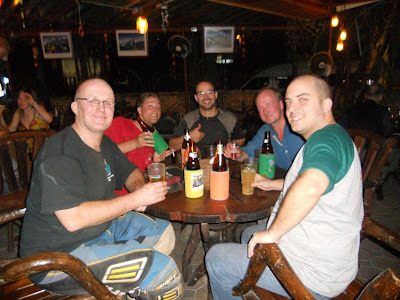 We had a cracking evening together and I left early the next morning praying that the bike would get back to town. It did just, but she did not feel at all happy. The next day I changed the sprocket and chain. Then tried to get her going, which I and many of the other generous helping hands could not do. 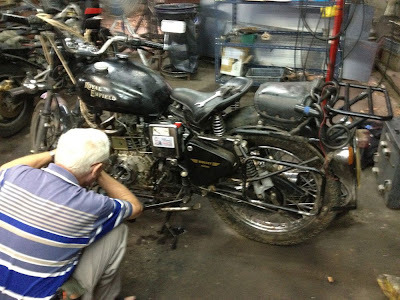 The biking community is a remarkable brotherhood and in particular Stephan from France spent a day with me stripping down the engine, then using his infinitely more knowledge than mine to try and crack the puzzle. The evening ended with failure, but new friends abundant. I pushed Batty to Joe's workshop the next morning. It was about a kilometre away. Tom was looking after the place as Joe was away. He very kindly let me work one bike by myself there and had me check a whole lot of other things as the motor was stripped down. Tom is in fact retired, but has a lifetime in engineering and motorcycle maintenance. Even with his experience we met with a blank. So that is where we are now, the bike is with the diesel specialists, and we will see what they come up with. The whole reason for being in Chiang Mai now was for the Horizons Unlimited Asian meeting. (Link to itinerary). This took place on Friday and Saturday and there were probably only 50 of us who had descended from around the world to attend. It was such a rich gathering of adventurers, combined with great stories from the presenters of various exploits that it had a near religious atmosphere. This morning I was taken up onto the roof terrace for an hour-long stretching and training routine. Susana does this all the time, and is super fit. Bending herself at angles that defy anything that this stiff old body can manage. Apparently this is the morning routine for the next 10 days. I'm sure it will do me good, but a little bit of gloss has come off the idea of a holiday in Lao. Last night we had a most enjoyable drink and then dinner with a couple whose names I cannot give. I have been banned from mentioning them on the Internet, as they do not want anyone to know that they are here. Of course that is fair enough, but how can I really talk about their delightful company, they're interesting wild and fun lives and the huge amount of good things they do for other people without qualifying it with their names? I was given their name and number by one of our artists, the irrepressible and magnificent Grey Jolliffe, and what a great connection and was. Travel has changed me, and not just the visiting of different places and meeting lovely people – but the journeys too – on a plane I feel ‘worldless’ as if I matter to everyone and no one all at the same time. Hi Harry, really enjoying your blog and it is bringing back many lovely memories. Bad news about the engine change and the issues your having with the new one. 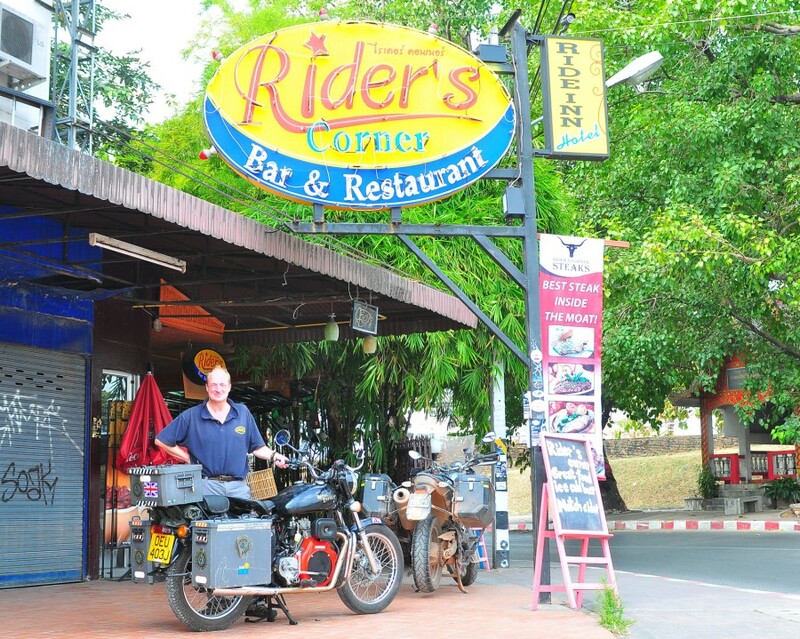 Good to see a picture of Dave G and the Riders Bar, hope Phil is still doing ok. Totally agree with your view of Northern Thailand and the riding there. Looking forward to more posts, stay safe and keep the adventure going. Regards John and Jane (XTZ660 Tenere.